But in MacLean’s writing, such sassiness works. 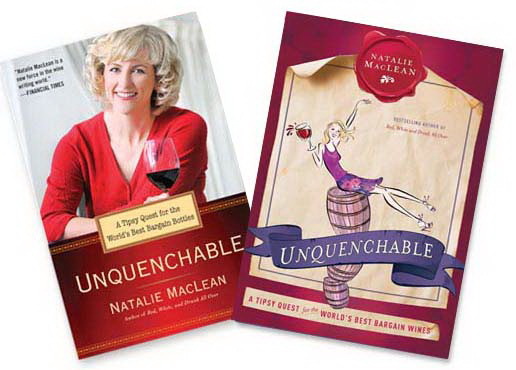 She’s an everywoman of wine, and in her latest book, Unquenchable: A Tipsy Quest for the World’s Best Bargain Wines, MacLean turns her attention to “demystifying wine pricing in relation to quality.” That’s fancy talk for finding impressive wines at affordable prices. The adventure recounted in Unquenchable is this: MacLean travels the globe making calculated stops in regions with “natural advantages that make winemaking inexpensive, whether that’s climate or cheap land and labor.” She visits Australia, South Africa, Provence, Sicily, Argentina, Portugal, Germany, and Canada, driving the wine routes, touring the wineries, and offering delightful descriptions of the characters encountered along the way. I’m a sucker for good narrative, and I found it in Unquenchable. Unquenchable works hard to show the personal, romantic side of wine. MacLean indicates that there’s romance in budget-priced wine (cute winemakers, a connection to the land, decades of tradition and artistry). I wanted advice on a bottle to open with dinner tonight. Thankfully, some information could be found at the end of each chapter. These “Field Notes” were undoubtedly my favorite part of the book, so much so, that I’m wishing for a pocket guide filled with MacLean’s insider tips, lists of top producers, best value wines, terrific pairings, recipe and menu ideas, and other resources that will help encourage informed quaffing. But (there had to be a but!) it’s important to note that not all the wines she recommends will appeal to all palates. For me, personally, the hot-weather regions she recommends aren’t all that appealing. My favorite part of Unquenchable ended up being MacLean’s lists of “Related Reading.” The lists serve as an effective postscript to each chapter, and each comes with the following disclaimer: “The following books, while seemingly unrelated to the main subject matter of this chapter, provided enjoyable reading before, during, or after my travels.” Some of these suggested readings are wine inspired, others are about history or travel. It’s pretty clear how a reading of Evita might inspire a dalliance with inexpensive Argentine wine. But Heart of Darkness and Portuguese vino? Now that’s a beguiling pairing. You can read more reviews of my new wine book Unquenchable here.